The F-Plan was originally published in 1987 by British author Audrey Eyton. It was the first high-fiber weight loss diet published and had pretty good results among those who used it. The diet is effectively a low-fat high-fiber diet. The theory is that a high intake of dietary fiber fills you up quickly, providing the bulk of food without the high calories. Most fiber content passes through the digestive system. In addition it was thought that by chewing high fiber foods, it was easier to detect the body’s satiety level. The staples of the diet are complex carbs, such as whole grains, baked potatoes, and legumes, and lots of fruit and vegetables. Fiber content will obviously be higher than the Recommended Daily Intake of 25-30g. A typical daily calorie count for the diet would be around the 1250 calories per day mark. Calorie-free drinks, tea, and coffee with low fat milk. Look for low fat recipes here. 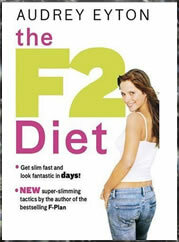 UPDATE: The original F-Plan has been superseded by the F2 Diet (by the same author). Newer version of the F Diet is basically the same high fiber diet described in the original but include more recipes and tools to help dieters be successful. The author used the feedback she received from the previous version to make F2 even better and easier to use and understand. Weight loss will probably occur simply because of the low calories involved. High fiber diets also have some positive health aspects. However, because of the high carbohydrate content, many people may find fluid retention, bloating, and gas to be a problem. Eyton, A. (2006). The F2 Diet. Bantam. A very good diet using foods readily available in your kitchen pantry. Recipes are easy and filling and this diet is not hard to stick to. But remember – losing weight is a lifestyle change if it is to be successful.